Sea ice is not a continuous, uniformly smooth sheet of ice, but rather is a complex surface that varies dramatically across even short distances. Sea ice is usually covered with snow, which insulates the ice and delays melting in the summer. The snow also modifies the electromagnetic radiation signal detected by satellites. (See Remote Sensing in the Studying section). Except during a melt season, the snow is usually dry, wind-blown, and hard-packed. Wind from a consistent direction can blow snow into ridges parallel to the wind direction, just like small sand dunes. These complex, fragile shapes are called sastrugi. Close-up view of frost flowers grown on new ice in very calm conditions. —Photo courtesy of Ted Maksym, United States Naval Academy. —Photo courtesy of Mark Tschudi, National Center for Atmospheric Research. Other features that form on the surface of sea ice are frost flowers, crystals of ice deposited on the sea ice when water vapor bypasses the liquid phase and becomes a solid. 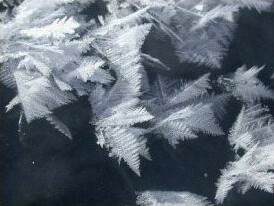 Frost flowers roughen the surface and dramatically alter its electromagnetic signal. If snow cover is thick, especially over relatively thin sea ice, the weight of the snow can push the ice down into the water below. The salty ocean water floods the snow and creates a salty, slushy layer. This flooded sea ice is more common in the Antarctic than the Arctic because there is typically thinner ice and more snowfall in Antarctica. When wind, ocean currents, and other forces push sea ice around, ice floes (sheets of ice floating in the water) collide with each other, and ice piles into ridges and keels. 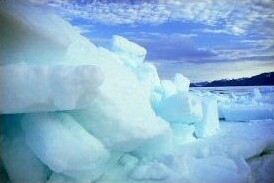 Ridges are small "mountain ranges" that form on top of the ice; keels are the corresponding features on the underside of the ice. The total thickness of the ridges and keels can be several meters (in some cases, 20 meters, or 60 feet, thick), and the surface ridges can easily be 2 meters (6 feet) or higher. Ridges create significant obstacles to anyone trying to traverse the ice. Ridges are initially blocky with very sharp edges. Over time, especially during the summer melt, the ridges erode into smaller, smoother "hills" of ice called hummocks. This process is similar to the erosion of jagged mountain peaks into smooth, rolling hills, but at an accelerated pace. When keels erode into smooth features, they are called bummocks. During summer, as the snow on top of sea ice melts, the meltwater can accumulate in depressions on the sea ice surface called melt ponds. These ponds absorb more heat than the surrounding sea ice from sunlight, and they grow in area and depth. The fresh water in melt ponds appears blue because light reflects and scatters off the sea ice surface from the bottoms and sides of the melt pond. If a pond melts through the entire thickness of the ice, the pond's color turns dark, like the ocean. 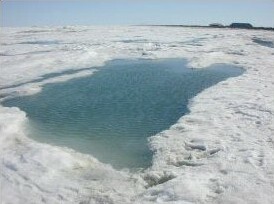 Melt ponds are more common in the Arctic than in the Antarctic, due to differences in relative humidity. Leads and polynyas are regions of open water, and they share several characteristics. Both are regions of open water where we would expect to find sea ice; both can influence weather and climate in their immediate surroundings, and both play important roles in wildlife habitats. However, they are different in fundamental ways. Leads are narrow, linear features, while polynyas are generally more uniform in shape and larger in size. Leads form because of the motion of the ice, while polynyas form from either upwelling warm water or persistent winds. During winter, open water remains in leads for only a short time before it begins to refreeze, while polynyas usually remain unfrozen for long periods of time.